After having a turkey sandwich for lunch for the third consecutive day, I was struck by a brilliant idea – I used to love those little personal-size pot pies when I was younger and it’s been ages since we made one. Even better, we had a couple pie crusts left from the weekend. Bam. 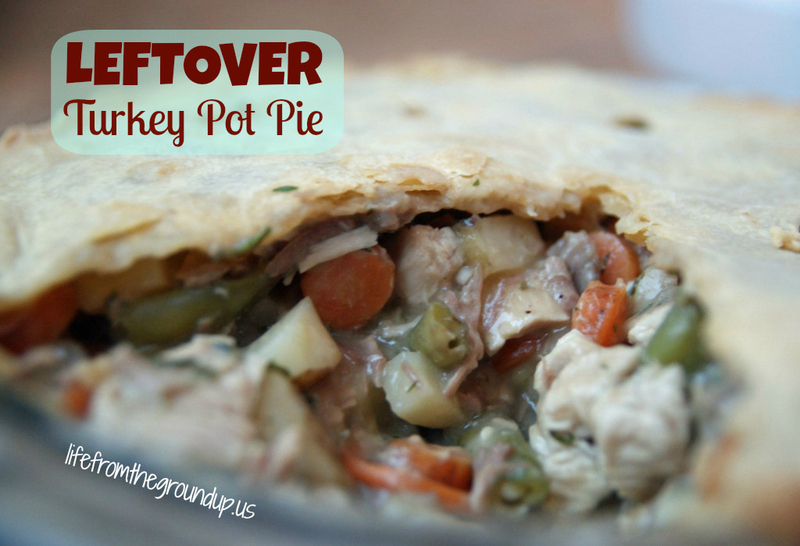 Leftover turkey pot pie. Heat your fat in a medium saucepan and add the onion, potatoes, carrots, and celery. Cook for about 5-7 minutes, or until mostly tender. Add the turkey and flour, mix well to combine. Add the broth slowly; you don't want it to get too soupy. I actually had about a cup of leftover gravy that I used instead of broth, so be creative! Add the seasonings, and preheat the oven to 400 F.
In a pie dish, lay one crust and trim the edges. Add the filling, and cover with the other crust. Again, trim around the edges, or just fold it over. I go for the "rustic" look and just toss the leftover bits on top. Bake for about 40 minutes, or until it's golden-brown and bubbly.